Yet another beloved Lower East Side institution is in danger of closing its super-cool doors forever. Cake Shop, the club, concert space and baked good purveyor where you can simultaneously dine on vegan whoopie pies and apple cider whilst listening to live music, needs your help. Or rather, your money. In recent months, the seven-year-old bar/club/music venue has run into financial difficulties, founding brothers Nick and Andy Bodor told The New York Times. To raise money, they have turned to the Internet crowdfunding site, Pledge Music, in the hopes that fans of the club and music lovers will help them rescue their sinking ship. 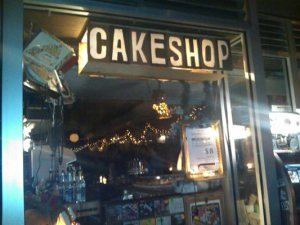 In addition to a court ordered payment of $58,000 to their landlord—which must be paid by July 26 to cover two years’ worth of lease taxes—Cake Shop is also facing a fine of $20,000 from the New York State Liquor Authority for several incidents of noise violations and selling alcohol to underage patrons last year. In the next two months, the Bodors need to raise at least $50,000 to stay in business (anything more would be icing on the cake), so they’re looking to Pledge Music. Like Kickstarter, the site’s campaigns will only receive their pledge money if their target goal is reached within their allotted time. Cake Shop’s campaign has a total of 60 days to raise their goal of $50,000. To date, they’ve raised 28 percent of that goal. The ultimate goal, however, is to collect three to four times that amount, Nick Bodor told the Times. The extra funds, he said, will go towards expanding the club. Some of his ideas include creating a Cake Shop record label and expanding the club’s website to include articles, performance videos, and new music releases. “We want to look at this as an opportunity to recalibrate our business,” he said.